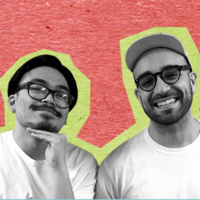 An artist project comprised of Anthony Febo and Ricky Orng, a Puerto Rican and Cambodian duo that continuously practices discovery, healing, and self preservation through their relationship with food, culture, and heartbreak. An interactive multicultural cooking show using spoken word as a vital ingredient to create recipes for celebrations. Adobo-Fish-Sauce is an active choice to celebrate in the face of bitterness. It is responding to “Go back to where you come from!” by bringing where they come from right to you. The show fuses spoken word, cooking, music, crying and laughing to create a one of a kind experience that can’t be found in any restaurant or open mic. They rescheduled apparently but I didn't get notified until I arrived which was disappointing.